If I could bring one thing back from London to Boston, I would bring Kate Middleton (she’s so cool). And if I could bring two things, I would bring Princess Kate and the 87 bus, which is sitting outside my window right now, waiting to pick up passengers. The bus route in London is just one part of a magnificent transportation network that the US needs to see and learn from. Within 45 minutes you can basically get anywhere from anywhere else, and it’s generally a lovely ride. Padded seats, great notices about when the train or bus is arriving, and then – it actually shows up when you expect! Plus, you get to see the most phenomenal things in the city – “my” bus goes past Big Ben, Westminster, the London Eye, Horseguards parade, the Supreme Court, Trafalgar Square, and Covent Garden, to name just a few stops. 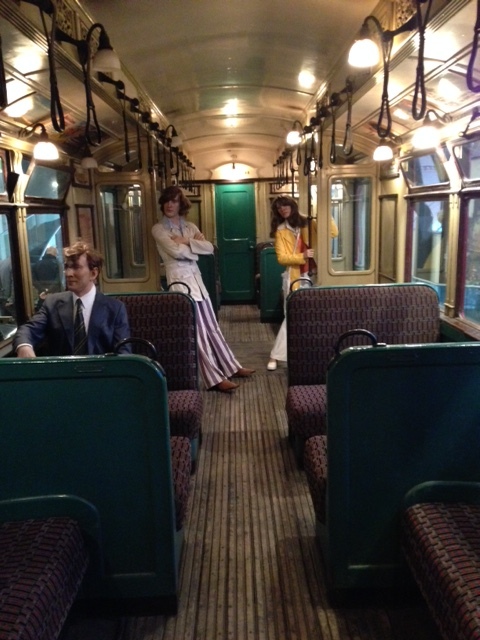 Today, I went to see where this wonderful system started with a visit to the London Transport Museum. It already boasts one of my favorite gift shops – I was eager to see how the museum itself would impress me. 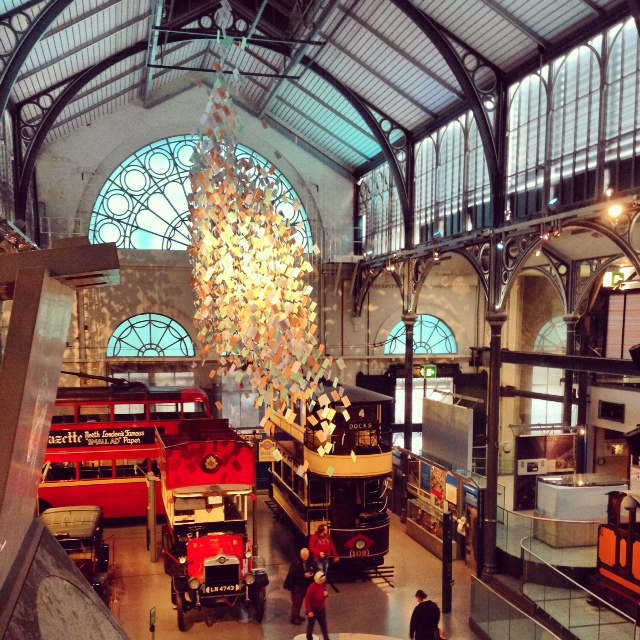 The museum, located at the corner of Covent Garden, is usually £15 but it was free with the London Pass (more on this awesomeness later). First impression: noisiest museum EVER. So many sound effects in the cavernous hall, combined with the shrieks of dozens of children visiting (this is a common occurrence in London which is wonderful for students but painful for the rest of us, especially in a place that echoes like this!). Still, it contains an awesome history. The museum covers the full history of transportation in London – from the times when rivers were convenient, if incredibly smelly, highways for all classes of people to the digging of the first underground and the conflicts that rose up as people challenged each other for the rights to drive the buses and trains of the city, to the innovations it propelled – like the first escalator. You can’t ask people to ride way underground AND demand that they take the stairs once they get off! It also exposes the controversy around transportation expansion – laying train tracks in London alone displaced more than 100,000 people, and the railway companies had no obligation to repay or rehouse displaced families. This expansion also literally created the commute – in 1800, nearly all Londoners lived within walking distance of their jobs, but by 1900 most had been pushed out of the city center and now had to rely on transportation to get to work. So uh… thanks? Old subway car – looking even cozier than they do now, with their wooden floors and leather handles! Looking at the trains and buses through history made me grateful for the relatively smooth ride we enjoy today. Much better than being pulled by a carriage or being driven by an operator who had tracks to guide his tram until they were removed… the day before. Hey, you have to evolve at some point, right? 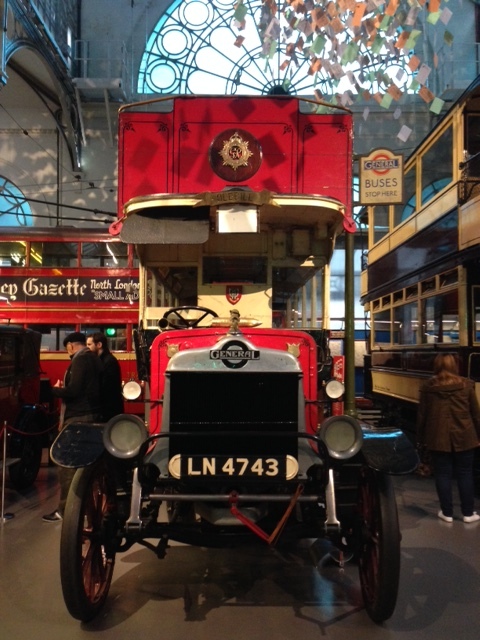 This is one of the coolest buses on display -a “battle bus” (B43). All across the city, London is remembering the 100 years since WWI broke out, and this bus is a part of that memorial. It saw action on the Western Front, bringing troops and supplies to the front lines. After the war, it returned to city streets. The tube also played its part in both wars – people actually had tickets to tube station shelters in WWI and some installed benches that could be turned into triple bunk beds to more comfortably house people at night. I hope that in the next 100 years, America will have figured out all these tricks for making public transport cool, accessible, and affordable so we can stop wasting energy and more efficiently get where we’re going. All aboard?